Anaheim Automation combines their DC Brushless controllers with their DC Brushless Motors in one convenient, streamline package. The two parts combined into one casing eliminates the need to wire the motor, and provides a clean look. These BLDC motor and controller combinations eliminate the possibility of mismatched components and wiring errors. These high-speed DC Brushless Motors with Integrated Controllers can operate at 4000RPM and are available in models ranging from 1.7" diameter to 3.4" diameter, with power ratings from 26 watt to 700 watts. They can also be customized to match the needed voltage, current, and maximum operating speed needed for your application. Special shaft modifications, cables and connectors are also available upon request. Anaheim Automation's line of Brushless Motors with Integrated Speed Controllers is a simple and cost-effective solution to many of your motion control application needs. The BLY17MDC Series is a compact microcontroller-based Programmable Brushless DC Motor Controller with Hall Sensor feedback for accurate speed measurement. With the two parts combined into one casing, the need to wire up the motor has been eliminated. It provides flexible, independent control of a Brushless DC motor from computers, or any machine controller with a serial port. The easy-to-use Windows software, BMC100, can be used to directly control the BLY17MDC for Real Time Motion through serial communication and/or change parameters such as speed, direction, brake setting and speed control constants. The controller has two modes through which it can control the speed of the motor: Analog Mode and Digital Mode. In Digital Mode, the user directly sets the desired speed. The Analog Mode provides standalone functionality to the controller with a dynamic DC voltage input (0-5V) to control the speed of the motor. The BLY17MD Series Brushless Integrated Motor/Controller combines a powerful BLDC motor design with the drive electronics in a compact package. 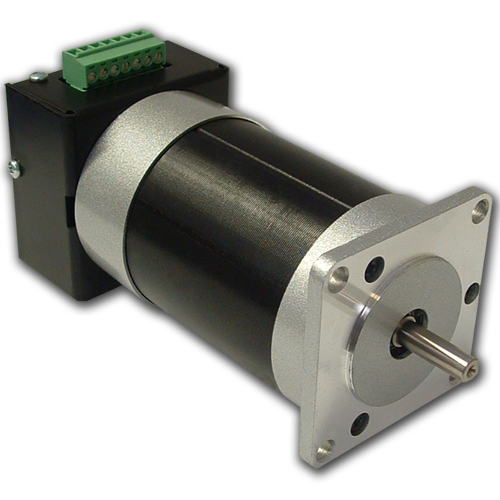 These integrated motors/drivers are cost effective solutions to many velocity control applications. By supplying a 0-5 VDC input or connecting a simple potentiometer, this BLDC motor is easy to control. Terminal Block connections allow this motor/controller to be easily installed. A pulse output is provided to digitally read the speed the shaft is turning at. We can also customize the winding to perfectly match your voltage, current, and maximum operating speed. Special shaft modifications, cables and connectors are also available upon request. The BLY17MDCUSB Series is a compact microcontroller-based Programmable Brushless DC Motor Controller with Hall Sensor feedback for accurate speed measurement and a mini USB port for serial communication. With the two parts combined into one casing, the need to wire up the motor has been eliminated. It provides flexible, independent control of a Brushless DC motor from computers, or any machine controller with a serial port. The easy-to-use Windows software, BMC100, can be used to directly control the BLY17MDCUSB for Real Time Motion through serial communication and/or change parameters such as speed, direction, brake setting and speed control constants. The controller has two modes through which it can control the speed of the motor: Analog Mode and Digital Mode. In Digital Mode, the user directly sets the desired speed. The Analog Mode provides standalone functionality to the controller with a dynamic DC voltage input (0-5V) to control the speed of the motor. The BLY17MDA Series is a compact construction that implements a DC Brushless controller and a DC Brushless motor in one streamline package. With the two parts combined into one casing, the need to wire the motor has been eliminated. The DC Brushless controller operates off 24VDC. The high-speed DC Brushless motor can operate at 4000RPM, can generate up to 35.4oz-in of continuous torque, and deliver as much as 105W, with the BLY17MDA4 offering. Using hall sensor feedback, the DC Brushless controller operates in a constant velocity mode within 5%. The driver is protected against over current (cycle-bycycle), hall sensor error and under voltage. An external potentiometer (10K) or external voltage (0.5-5VDC) can be used to control the speed. The direction of the motor can be preset by the direction control input. A Brake function can be done by grounding the Run/Stop input. The BLY17MDA-2W Series is a compact construction that implements a DC Brushless controller and a DC Brushless motor in one streamline package. With the two parts combined into one casing, the need to wire the motor has been eliminated. The DC Brushless controller operates off 24VDC in a two wire system. The high-speed DC Brushless motor can operate at a fixed speed of 4000RPM, a no-load speed of 6200RPM, can generate up to 35 oz-in of continuous torque, and deliver as much as 104W, with the BLY17MDA4-2W offering. The driver is protected against over current (cycle-by-cycle), hall sensor error and under voltage, operating in an open-looop velocity mode. The direction of the motor can be preset by the direction control input by tying the direction wire to the power or ground input. The BLWR23MD Series Brushless Integrated Motor/Controller combines a powerful BLDC motor design with the drive electronics in a compact package. These integrated motors/controllers are cost effective solutions to many velocity control applications. By supplying a 0-5 VDC input or connecting a simple potentiometer, this BLDC motor is easy to control. Terminal Block connections allow this motor/controller to be easily installed. A pulse output is provided to digitally read the speed the shaft is turning at. We can also customize the winding to perfectly match your voltage, current, and maximum operating speed. Special shaft modifications, cables and connectors are also available upon request. The BLWR23MDA Series is a compact construction that implements a DC Brushless controller and a DC Brushless motor in one streamline package. With the two parts combined into one casing, the need to wire the motor has been eliminated. The DC Brushless controller operates off 24VDC. The high-speed DC Brushless motor can operate at 4000RPM, can generate up to 62 oz-in of continuous torque, and deliver as much as 185W, with the BLWR23MDA5 offering. Using hall sensor feedback, the DC Brushless controller operates in a constant velocity mode. The driver is protected against over current (cycle-by-cycle), hall sensor error and under voltage. An external potentiometer (10K) or external voltage (0.5-5VDC) can be used to control the speed. The direction of the motor can be preset by the direction control input. A stop function can be done by grounding the Run/Stop input. The BLWS23MDA Series is a compact construction that implements a DC Brushless controller and a DC Brushless motor in one streamline package. With the two parts combined into one casing, the need to wire the motor has been eliminated. The DC Brushless controller operates off 24VDC. The high-speed DC Brushless motor can operate at 4000RPM, can generate up to 62 oz-in of continuous torque, and deliver as much as 185W, with the BLWS23MDA5 offering. Using hall sensor feedback, the DC Brushless controller operates in a constant velocity mode. The driver is protected against over current (cycle-by-cycle), hall sensor error and under voltage. An external potentiometer (10K) or external voltage (0.5-5VDC) can be used to control the speed. The direction of the motor can be preset by the direction control input. A Stop function can be done by grounding the Run/Stop input. The BLWS23MDC Series is a compact microcontroller-based Programmable Brushless DC Motor Controller with Hall Sensor feedback for accurate speed measurement. With the two parts combined into one casing, the need to wire up the motor has been eliminated. It provides flexible, independent control of a Brushless DC motor from computers, or any machine controller with a serial port. The easy-to-use Windows software, BMC100, can be used to directly control the BLWS23MDC for Real Time Motion through serial communication and/or change parameters such as speed, direction, brake setting and speed control constants. The controller has two modes through which it can control the speed of the motor: Analog Mode and Digital Mode. In Digital Mode, the user directly sets the desired speed. The Analog Mode provides standalone functionality to the controller with a dynamic DC voltage input (0-5V) to control the speed of the motor. The BLWS23MDCUSB Series is a compact microcontroller-based Programmable Brushless DC Motor Controller with Hall Sensor feedback for accurate speed measurement and a mini USB port for serial communication. With the two parts combined into one casing, the need to wire up the motor has been eliminated. It provides flexible, independent control of a Brushless DC motor from computers, or any machine controller with a serial port. The easy-to-use Windows software, BMC100, can be used to directly control the BLWS23MDC for Real Time Motion through serial communication and/or change parameters such as speed, direction, brake setting and speed control constants. The controller has two modes through which it can control the speed of the motor: Analog Mode and Digital Mode. In Digital Mode, the user directly sets the desired speed. The Analog Mode provides standalone functionality to the controller with a dynamic DC voltage input (0-5V) to control the speed of the motor. The BLWS23MDA Offline Series is a compact contruction that implements an Offline Brushless Controller and a DC Brushless Motor in one steamline package. With the two parts combined into on casing, the need to wire the motor has been emliminated. The Offline Brushless Controller operates off 120VAC. The high-speed DC Brushless Motor can operate at 3000 RPM, generate up to 71 oz-in of continuous torque, and deliver as much as 157W with the BLWS23MDA5S-160V-3000 offering. Using hall sensor feedback, the Offline Brushless Controller operates in a contant velocity mode. The driver is protected against over current (cycle-by-cycle), hall sensor error and under voltage. An external potentiometer (10K) or external voltage (0.5-5VDC) can be used to control the speed. The direction of the motor can be preset by the direction control input. A stop function can be done by grounding the Run/Stop input. The BLWR235S-36V-4000-04 is a custom Brushless DC Motor and Controller, originally designed for pump applications. Combining a BLDC motor with the drive electronics in a single unit, this motor/controller combination is an overstock item offered for a limited-time at an affordable price! It is set to run at currents between 2 and 20A (peak) and 15-50VDC, and is equipped with two internal potentiometers to allow for control of peak current and speed. A compact size, this motor and controller provides high performance and reliability, at an unbeatable price. The BLY34MDA Series is a compact construction that implements a DC Brushless controller and a DC Brushless motor in one streamline package. With the two part combined into one casing, the need to wire the motor has been eliminated. The DC Brushless controller operates off a 24VDC or 48VDC power supply. The high-speed DC Brushless motor can operate at 3200RPM, can generate up to 300 oz-in of continuous torque, and deliver as much as 700W, with the BLY34MDA4 offering. Using hall sensor feedback, the DC Brushless controller operates in a constant velocity mode. The driver is protected against over current (cycle-by-cycle), hall sensor error and under voltage. An external potentiometer (10K) or external voltage (0.5-5VDC) can be used to control the speed. The direction of the motor can be preset by the direction control input. A Stop function can be done by grounding the Run/Stop input.